Badge – a coat of arms or simple heraldic symbol, such as a shield. Bunting – is cloth decorated with the national colors. The term is also used for the woolen cloth used in making flags. Canton – any quarter of a flag, but commonly means the upper left (hoist) quarter, such as the field of stars in the flag of the United States or the Union Flag in the Australian Flag. Charge – a figure or symbol appearing in the field of a flag. Emblem – a device often used as a charge on a flag. It may be heraldic in origin or modern, for example the maple leaf on the Canadian Flag. Field – the background of a flag; the color behind the charges. 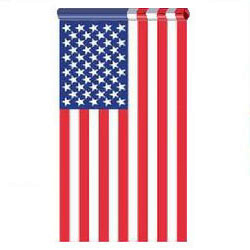 Fimbriation – a narrow edging or border, often in white or gold, on a flag to separate two other colors. Fly – the half or edge of a flag furthest away from the flagpole. This term also sometimes refers to the horizontal length of a flag. Gonfalon- A banner that hangs from a crosspiece or a frame, originated in the medieval republics of italy as an ensign of the state or office. Gonfalons have been adopted in many universities around the world as college or institutional insignias, and many use them to identify and lead colleges and schools within the university in academic procession. Grommet- is a metal ring place along the hoist of a flag to attach the halyard. 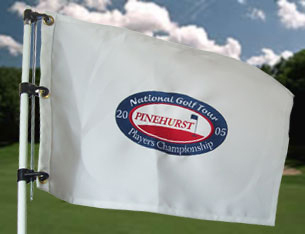 A flag with grommets is the most commonly displayed flag and is typically flown horizontally on a vertical freestanding outdoor flagpole. 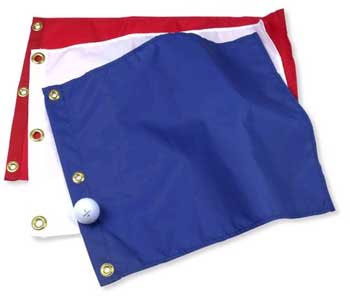 The hoist edge is reinforced canvas with brass grommets designed to attach the flag to the halyard (rope) of the pole. These flags can also be flown on a variety of other poles without rope. 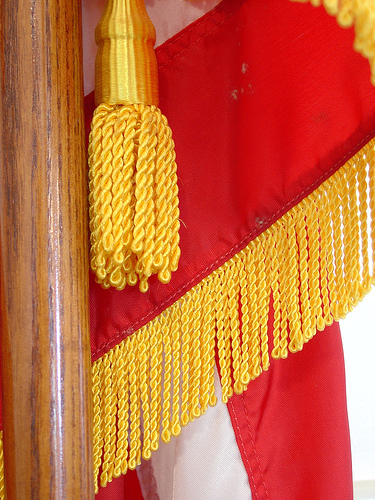 Halyard – a nylon braided rope used to hoist a flag up a flagpole. 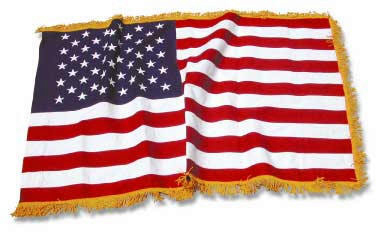 Header – a heavy cloth strip, usually canvas, sewn to the hoist edge of a flag and often with grommets for hoisting. Hoist – the half or edge of a flag nearest to the flagpole. This term also sometimes refers to the vertical width of a flag. Length – the span of a flag along the side at right angles to the flagpole. 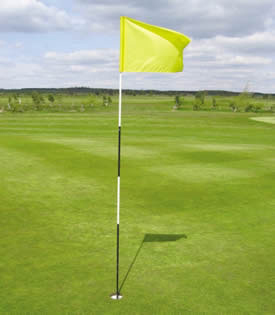 Staff – is a pole a flag hangs on. Width – the span of a flag down the side parallel to the flagpole. 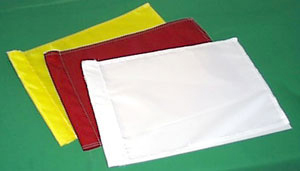 Cotton– Cotton is a traditional and great looking flag material. This natural fiber bunting is made of heavyweight 2×2-ply mercerized cotton. It combines extremely bright, long lasting colors, good wearing quality, and excellent overall appearance. If you are in need of a classic look for your flag, this is the best choice. Cotton flags are NOT recommended for outdoor use. 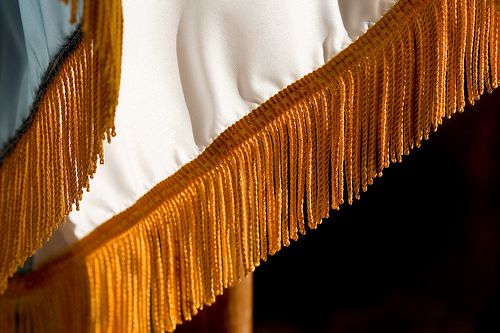 Rayon– A silk-like polyester material mainly used on our stick/desktop flags. Half Staff – a style of flag display in which the flag is hoisted to half of the potential height of the available flag pole. Usually this is done by first raising the flag to the top, then lowering it halfway. (Equally valid ‘half-masting’ is flying the flag at two-thirds of its normal height.) This usually denotes distress or a show of grief, such as mourning a death. Half Mast – same as Half Staff. The use of ‘mast’ suggests naval use, but typically the two terms are interchangeable. Distress – flying the flag upside-down. The system of international maritime signal flags is a way of representing individual letters of the alphabet in signals to or from ships. It is a component of the International Code of Signals. • Each flag spells out a letter of an alphabetic message. • Individual flags have specific and standard meanings; for example, diving support vessels raise the “A flag” indicating their inability to move from their current location because they have a diver underwater. • One or more flags form a code word whose meaning can be looked up in a code book held by both parties. An example is the Popham numeric code used at the Battle of Trafalgar. • In yacht racing and dinghy racing, flags have other meanings; for example, the P flag is used as the “preparatory” flag to indicate an imminent start, and the S flag means “shortened course”. The International Code of Signals were first published in 1931 and have been used every since. Each flag has a specific meaning, and by flying a sequence of flags together, you can send a very specific message. These flags are a great means of communication when the sender and receiver don’t speak the same language. A Alpha – I have a diver down; keep clear and pass at low speed. B Bravo – I am loading, unloading or carrying dangerous goods. C Charlie – Yes (confirming a preceding signal). D Delta – Keep clear, I am maneuvering with difficulty. E Echo – I am altering course to starboard. F Foxtrot – I am disabled, communicate with me. G Golf – I require a pilot. On a fishing vessel: I am hauling in nets. H Hotel – I have a pilot on board. I India – I am altering course to port. J Juliet – I am on fire and have dangerous cargo on board; keep clear. K Kilo – I wish to communicate with you. L Lima– You should stop your vessel immediately. M Mike– My vessel is stopped and making no way through the water. N November – No or negative (in response to a preceding signal). O Oscar – Man overboard. P Papa – I am about to put to sea. Q Quebec – My vessel is healthy and I request clearance to come into port. R Romeo – Single letter code R has no allocated meaning. S Sierra – I am moving astern under power. T Tango – Keep clear, I am engaged in trawling. U Uniform – You are running into danger. V Victor – I require assistance. W Whisky – I require medical assistance. X X-ray – Stop carrying out your intentions and watch for my signals. Y Yankee – I am dragging my anchor. Z Zulu – O require a tug. On a fishing vessel: I am laying nets. AP/CF – Answering Pennant/Code Flag. Flown to the end or acknowledge a message and/or show that the international code flags are being used. 0 to 9 – Pennants indicating numerals. FS – First substitute (for the first flag in the hoist). SS – Second substitute (for the second flag in the hoist). TS – Third substitute (for the third flag in the hoist).